I continue to learn new things about the Cross House, and each discovery is a thrill. 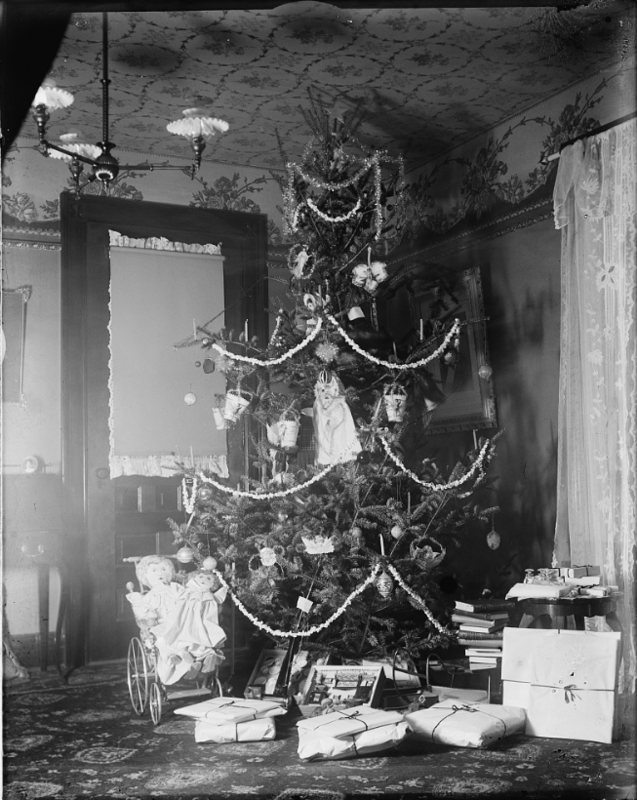 Yesterday, Kelly of Old House Dreams did a holiday post, and used a great image. The image is also timely for today, Christmas Eve. Courtesy of the Library Of Congress. By a wonderful coincidence, the image also highlighted an issue I was writing a post about. 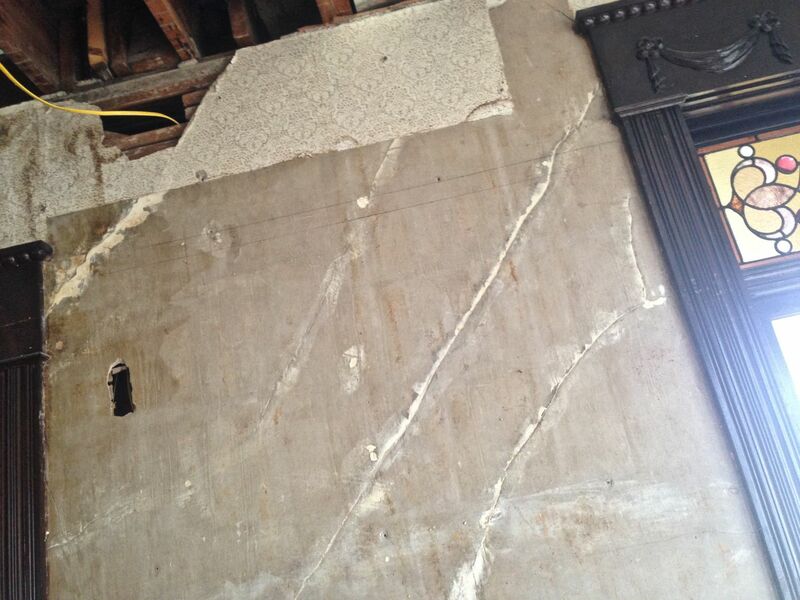 See the papered frieze at the top of the walls? See the picture rail just below the frieze? This was a strip of molding common to houses for many decades, and was used to hang pictures from (with special hooks). 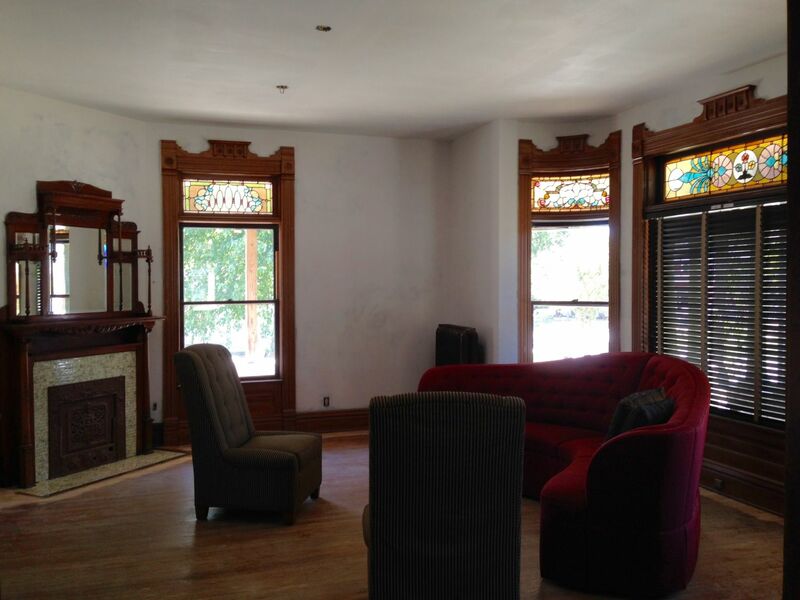 The parlor in the Cross House, primed white. Note the lack of a picture rail. I knew such a rail MUST have existed, as this protected expensively done plaster walls from being punctured with a zillion holes over time. Some sleuthing (isn’t sleuthing fun!) confirmed that a picture rail did once exist, and even its precise location, which I penciled in. The bottom of the rail is 101-inches above the floor, and the top of the rail is about 22-inches below the ceiling. Note also ceiling paper, another standard of the era. 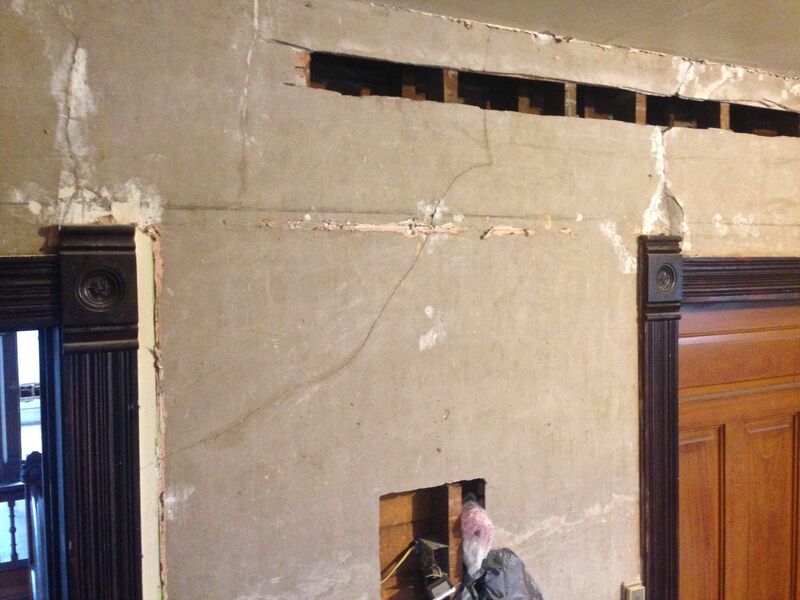 There is NO picture rail remaining in the Cross House. Thus, I went on the hunt for traces of evidence. In the foyer, the rail was almost kissing the ceiling. Oh! In the dining room the rail was again about 22-inches below the ceiling. Oh! Dining room, with the lost rail penciled in. The paper is 1970s. The upper stair hall did not have a picture rail. It did have wall paper, a paper frieze, and ceiling paper. 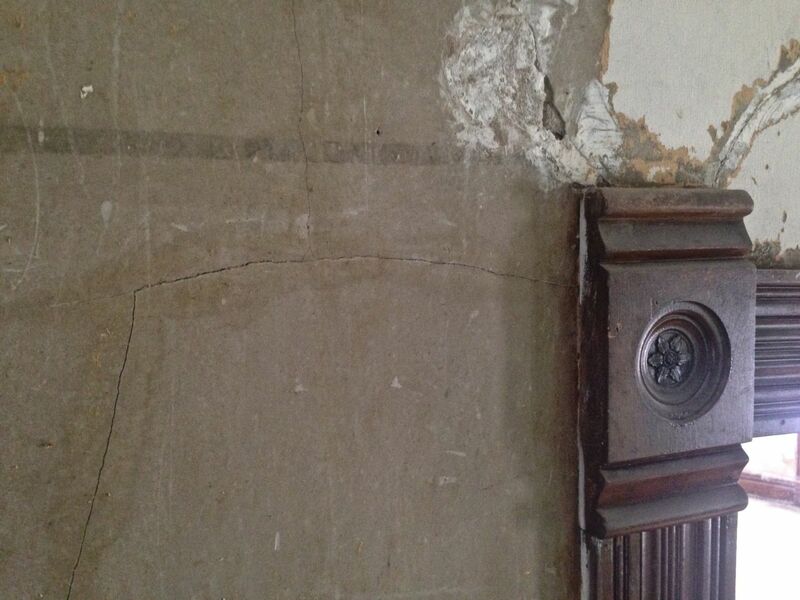 There is however a very curious thing, which also exists in several rooms on the second floor: a faint black thin horizontal line on the bare plaster. Huh? In the round bedroom there is clear evidence of the lost rail. Oh! I never noticed before! In the hexagon bedroom is the same faint black line. The lost rail would have covered the line. The line cannot be an imprint of the lost rail, as the rail was much wider. I will be replacing all the missing picture rail, as the rooms look just a bit naked without all their original bits. 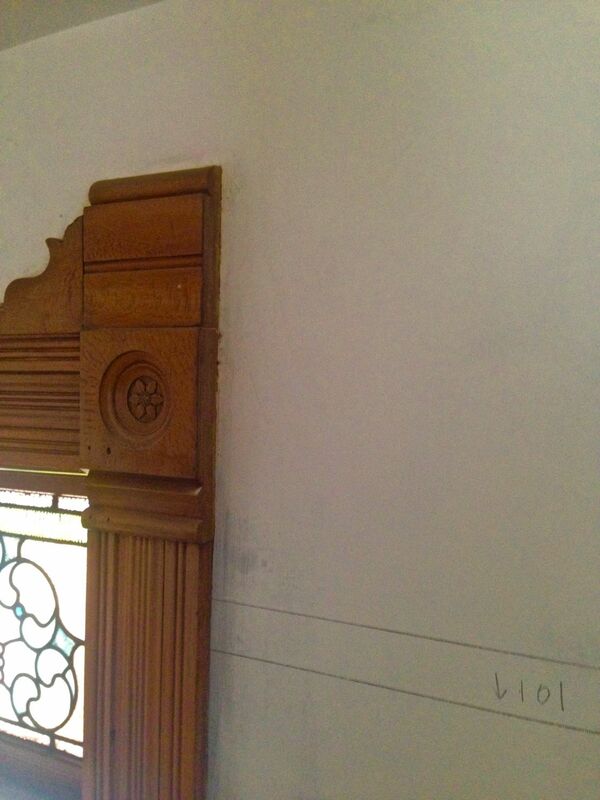 The headache will be staining the rail to match the extant trim in the various rooms. Today, crown molding is common, but what I like about picture rail is that it is such a distinctly period look. And my period house cries out for its lost rail. 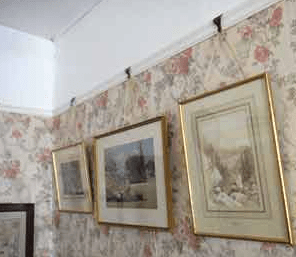 Just a thought about the seemingly narrow width of the black line – only a narrow section of the bottom of the picture rail touches the wall, the rest stands proud of the wall so the hook can loop over it. 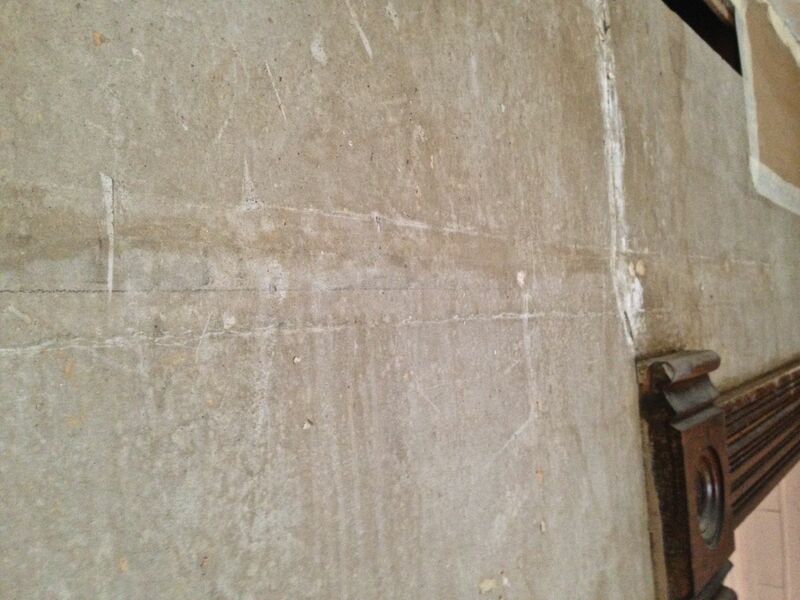 To me that thickness looks about right given the rail I just installed and the ghosts on my own walls and casings. Hope you have a very merry Christmas (and maybe someday we can both have completed rooms as lovely as Kelly’s photo). I was just about to say the same thing Meg said! Oh how timely this post is for us! 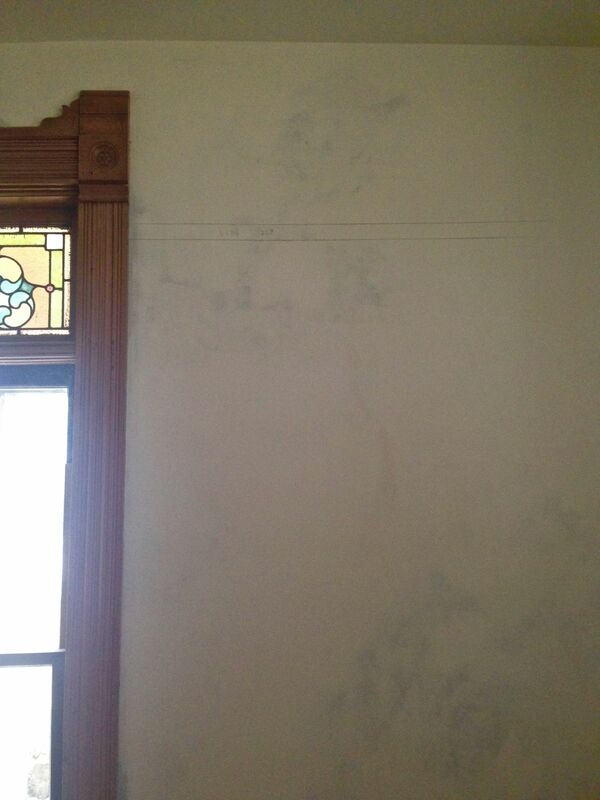 Restoring our lost picture rail is now nearing the top of our to-do list here in South Dakota. 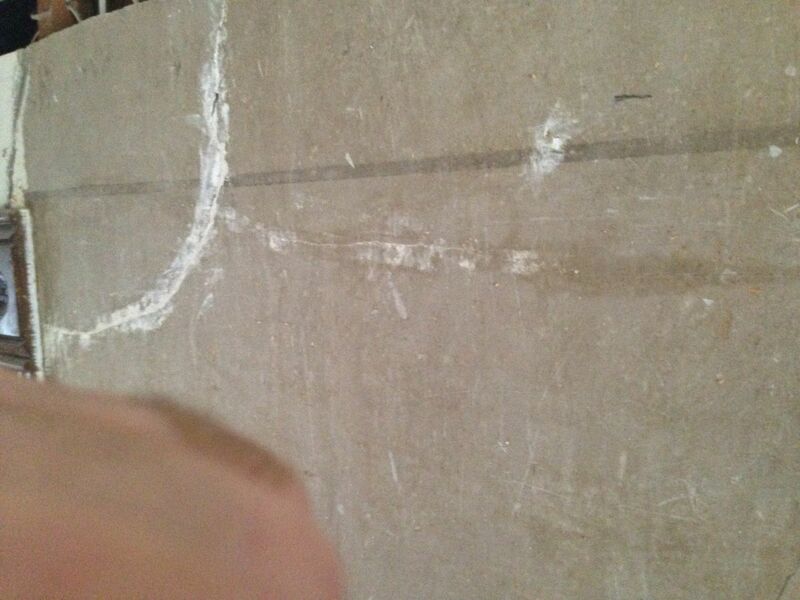 We have an IDENTICAL black line on our walls- right where the picture rail originally was. I am wondering- do you plan to wallpaper above the picture rail? Paint it the same color as the ceiling? Paint the same color as the walls? Where are you going to obtain our picture rail? We were lucky enough to find a 12″ piece of the original in the crawlspace (what a thrill) and are going to look into having it custom made by a local millwork company. 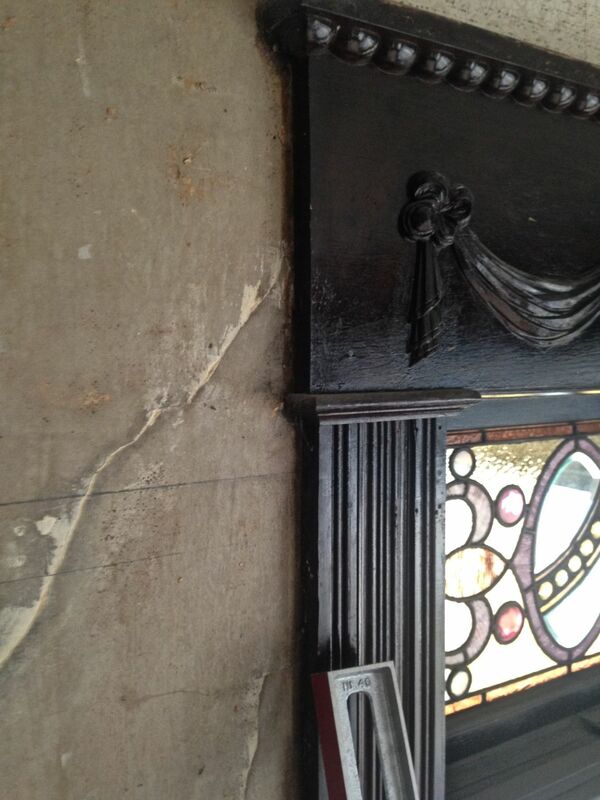 Good luck with the picture rail at the Cross House! 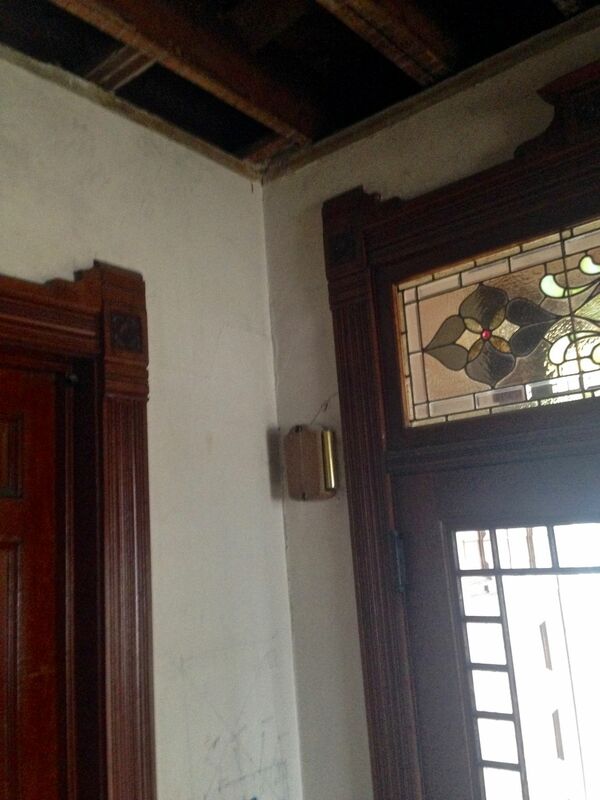 Hi Ross, I was just taking a look at the pictures you provided above and noticed that you don’t have any crown molding, did you have it taken out so you could repair the plaster of did the Cross House have something else that replace crown molding? David, the Cross House had no crown molding. Just picture rail. This was common for the era. I like the subtle class of picture rail, in addition to its functionality. Our house has it in most of the major rooms, installed up at the ceiling, rather than at a frieze level below. It adds a nice modest finishing touch of detail that’s in keeping with the classic but modest interior millwork. And perhaps you have artist friends who would enjoy using those rails.